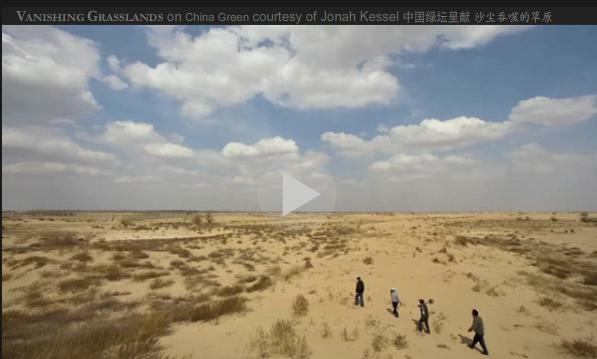 Vanishing Grasslands is a mixed media project documenting desertification in northern China. Over 400 million people in China are being affected by desertification today. Over population, over grazing and poor management practices have degraded grasslands to the extent the land has become unfarmable and unsustainable. Sands from the north are growing at 2500 square miles a year as the global environmental issue is threatening people everywhere. This story follows Shanghai Roots & Shoots efforts to help stop desertification in Inner Mongolia through a tree planting program called The Million Tree Project and through elementary and adult education. This project originally appeared in China Daily, China's national English language newspaper and was then donated to Shanghai Roots & Shoots to help raise awareness of an issue affecting citizens world wide. Shanghai Roots & Shoots is a subsidiary non governmental organization of the Jane Goodall Institute. A goal of these global nonprofits is to empower people to make a difference for all living things.